No more tossing and turning on an uncomfortable sofa, now your guests can recline in peace on a flat bed with plenty of cushioning for a good night's sleep! Packing up the Sonja is as easy as 1, 2, 3 literally. Fold in each of the sides and bring down the top seat and you're done. While function is a big part of the appeal it shouldn't be forgotten that the Sonja is also easy on the eye. Lush fabric finishings adorn the simple symmetrical shape making it a worthwhile addition to any home. 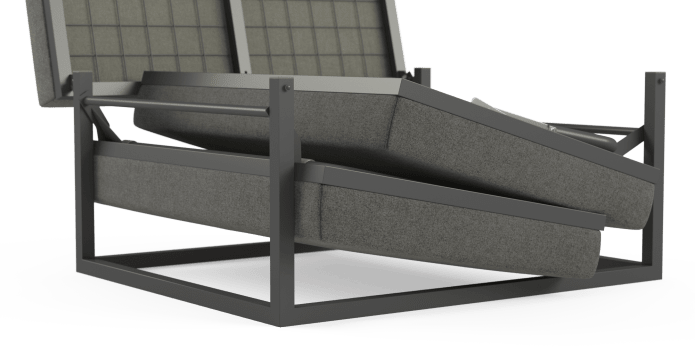 Featuring a sturdy spring supported metal frame, the Sonja Ottoman Sofa Bed offers great stability for sleeping and even that short nap. Is the piping matching or contrast? Great ottoman sofa bed. Difficult to find elsewhere. Nice and compact and appears to be good quality. Great staff communication and delivery service. Product was as described, in fact, exceeded our expectation. Quick delivery. 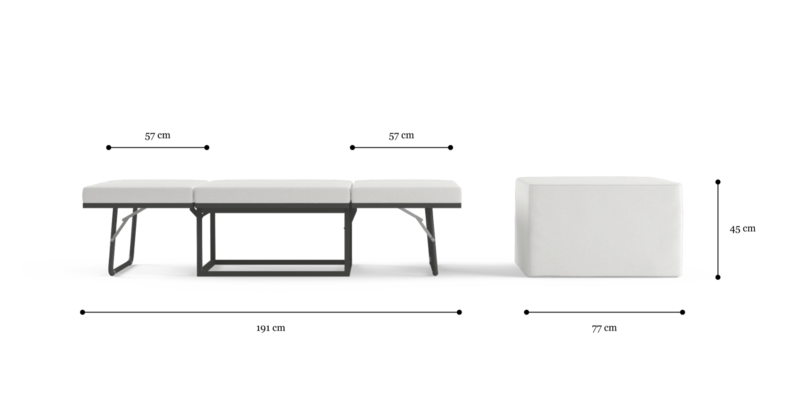 The assembly of the furniture was minor and therefore very user-friendly. Furniture quality is also really good, and the customer service was friendly at all times. I have no complaints, therefore I would definitely recommend Brosa. The whole process from choosing the item, ordering and delivery was so straightforward, and effortless. This together with the range available, would be reason enough to recommend Brosa. Great and easily accessible website. Lovely designs. Bought a single ottoman bed, it is a handy, sturdy seat and easily opened guest bed. Very happy customer. Your service was excellent. The price was great and the product is of a very high quality. We have made good use of it over the past weeks. Products are well designed and manufactured, and customer service is excellent. The product was as advertised, the delivery was as advised. I liked the product and thought it was good value and well made. It compared favourably with similar items. Quality product abd fabulous customer service. I am very happy with the quality of my Brosa Ottoman/bed. Communications about the delivery time was excellemt. Smart clever product ideal for small spacea. Good quality products, good service, very reasonable prices. Good service and quick delivery. Happy with product purchased. Product seems good. Delivery was fine. Good products and the delivery was pretty quick. Great website with helpful product information. Easy ordering system. Very happy with our order. Purchased two of these stylish ottomans as spare beds for guests, and have been very pleased with them. Easy and fast to set up, but better still every guest has slept well on them. Very are very happy with their service and our purchase. Your customer service was impeccable. Your product was above expectations. I was able to monitor my order from day one, until delivery. Needed a single bed for sleepovers at Granny's. yet folds out, quickly & neatly, to a comfortable single bed! Wish we'd had it when our children were young- as "the sickbed" !! I was worried when I purchased this ottoman bed that it would be very complicated so when I received it and realised that it opens up in 15 seconds into a full length bed I was really pleased. The bed is sturdy too and fits an extra guest really well. We had guests come visit us 3 weeks ago and normally everyone would fit in our spare bedroom but this time around we needed an extra space for someone to stay in the living room. 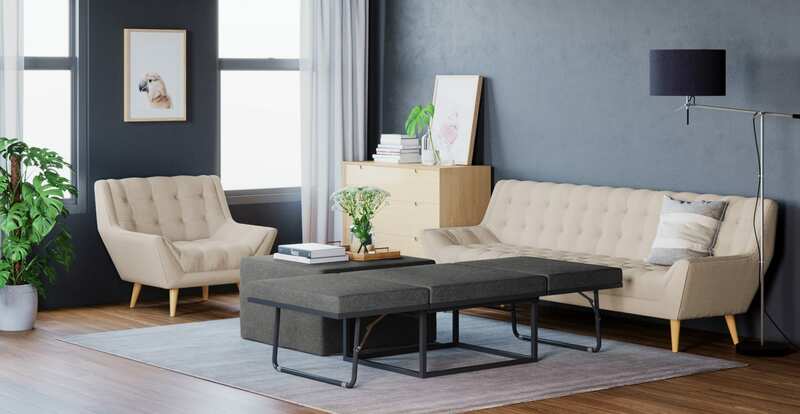 We picked out the ottoman bed as a good alternative to getting an air bed or clunky sofa bed. Best decision we made ever. So please with our purchase and have already recommended it to 2 other friends who said they'll purchase. 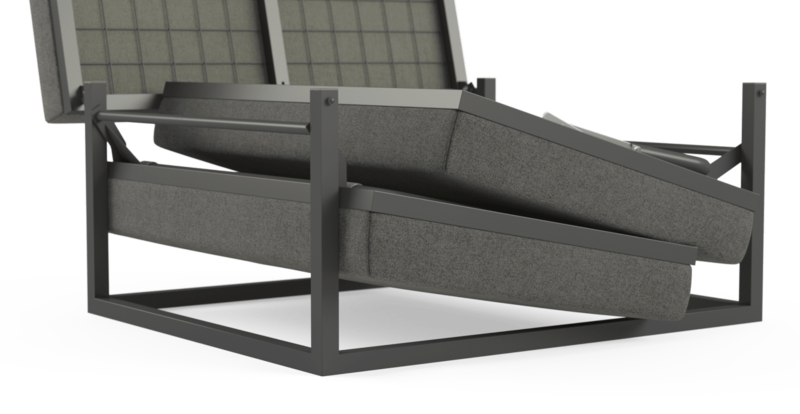 See, touch and feel our fabrics used on our Sonja Ottoman Folding Bed. For Free! Simply select up to 3 fabrics and add them to your cart. Delivery is on us. Good news! Sonja Ottoman Folding Bed is currently on display in our Alexandria Collingwood studio.